Steve worked as reporter for BBC Radio London in the 70s. He dreamt up and edited Breakthrough, a live rock magazine based on FM radio in the US. He also presented it along with colleagues helpfully working pro bono - including John Peel, Bob Harris, Richard Williams, Geoffrey Cannon and Charlie Gillett. Charlie went on to present his own show Honky Tonk, which Steve originally also produced, thereby breaking Dire Straits and pioneering world music radio. Station colleagues including Robbie Vincent, Andy Finney and Mike Sparrow helped out regularly. John Peel called Breakthrough (see Review pages) “almost exactly the kind of thing I wish I were doing for Radio 1” and Steve’s fellow Cambridge Eng Lit graduate Tony Wilson - then just moving to Manchester - was also a fan. Steve recalls Breakthrough was one of the many inspirations for Tony moving away from news reporting to more cultural programming. The show included live sessions and demos from musicians including Pete Townshend and what's believed to be the only recorded solo gig by Steve Took (the other half of T Rex)*. Guitarist Andy Roberts, activist John Hopkins ("Hoppy"), Charles Shaar Murray, B.S. Johnson, John Michell, Marsha Hunt, Geoffrey Cannon, Anna Raeburn, Cream lyricist Pete Brown, sound poet Bob Cobbing, and poets Anne Waldman, Brian Patten and Paul Ableman were also contributors. Steve's live and recorded interviewees included Captain Beefheart, Lou Reed, Bob Weir, Shirley Alston, Dr John, The Turtles, Peter Wolf, Sha Na Na, Pete Townshend, Alice Cooper, Stephen Stills, Rita Coolidge, Roxy Music, Memphis Slim, Ray Manzarek, B.B. King, Jackson Browne, Steve Miller, Jim Capaldi, Carly Simon, Curtis Mayfield and Alan Ginsberg. Brigid Polk phoned in live from Andy Warhol's The Factory. 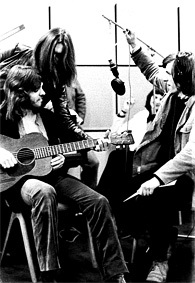 The show probably remains the first and only totally unstructured talk and music show on British radio – there was no running order. Incidents including breast-feeding in the studio and Hoppy's unrestrained language led to management - and tabloid - concern. The show continued with Mike and Andy after Steve left the station. Steve has kept some of the tapes which have kindly been digitized by BBC Archive. Steve believes he was the first British radio DJ to play Bruce Springsteen. He also claims to have introduced Pete Townshend to Elton John at The Speakeasy (or to have tried to do so). 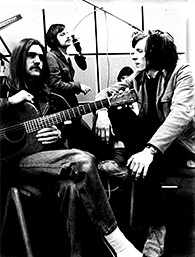 Beatles Press Officer Derek Taylor was a friend of the show. George Harrison once offered to help Steve start a rock radio station. Steve's duties at Radio London also included editing and presenting the South East News on BBC Radio 4. He was a weekly columnist on BBC Radio 4's Start the Week with Richard Baker. Later he was one of the first chat show hosts on the new London Broadcasting, sharing the Sunday lunchtime slot with Tony Palmer (1973-4). He was part of the original reporting team on BBC Radio One's Newsbeat, covering major stories like Watergate from London. He also worked for the Canadian Broadcasting Corporation, reporting from Lisbon on the 1974 Carnation Revolution. Along with Paul Gambaccini, he stood in for John Peel on Sounds of the Seventies. In 1977 Steve was one of the first two reporters on BBC Radio 4's File on Four - reporting from Cuba, Malta, Pakistan and on the conflicts in Beirut, Belfast, and Rhodesia. His first UK report exposed rigged pay productivity deals. Two programmes campaigned for more open government - Jim Prior allowed microphones to follow a new minister into office for the first time (1979), while William Rogers was persuaded to reveal internal Whitehall policy memos (then a formal breach of the Official Secrets Act). Steve had been asked to help start the show after writing a vitriolic attack on Radio 4 for The Listener - Dear Ian McIntyre - which included a plea for a current affairs show whose voices weren't confined to "important people". "I guess you could define us as people who held hands to the Beatles and hardly ever listen to Radio 4... Bob Dylan, James Taylor, Joni Mitchell, Cat Stevens, all those people who sound as familiar on Radio 4 as names from a telephone book in Djakarta... It is true that if such programmes are no longer presented by men in dinner-jackets..they often seem to be presented by men with their ties screwed on very tightly indeed... the report from Rhodesia... dealt with the guerrilla war only as it affected the white minority... current affairs are often seen only from the point of view of elderly inhabitants of the south east... why is there no weekly slot for a current affairs documentary which could respond to the latest news rather than being programmed weeks in advance... As far as I could tell, in the comatose state induced by this programme, nothing new was said at all. The script could have been written before the invention of radio... Radio 4 discounts the existence of popular culture. Its content assumes the popular is necessarily shoddy... film, rock music, television, all of which are still treated with patronising contempt on a radio channel which plays more Donald Swann than Elton John.... Almost half the speech items in Pick of the Week were memories or nostalgia... I know that many of the listeners to Radio 4 feel that the best in British life is long gone. I also know that audience figures are falling and... the BBC is supposed to reflect the status quo and what is England except, as Kate Millett says with such appalling clarity, 'a whole society resistant to change?'" "If this looks like a crib from Steve Bradshaw... that is exactly what it is... I am in complete agreement with what Paul Ferris wrote - as if echoing Steve Bradshaw - in last Sunday's Observer; "Radio 4 is soggy at the edges... competent, hard-working, but bored with itself.... (see Bradshaw and Ferris in support) the network seems obsessed with days gone by..."
In 1982 Steve became the first presenter of radio's first environmental series - Groundswell. Other Radio 4 documentaries included the series Ten Years On (1975) on the "grisly end" of 60s counter-culture ("a Jazz Age bred in the universities"). In Defying Rwanda's Killers (2001) Steve profiled Paul Rusesabagina - later celebrated as the hero of Hotel Rwanda - and again with Anne Koch made Murder on Embassy Row (1999) on the terrorist murder of Orlando Letelier in Washington DC. Steve also presented versions of some Life on the Edge TV stories for BBC World Service's Outlook.